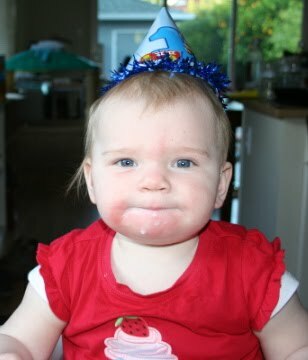 Welcome to Isabelle's Blog: Happy Birthday, Charlotte! It's been a year since our little girl joined our family. What a year! She has turned into this little toddler, actually not that little. 95% in height, 99% in weight. She loves to eat and she can never have enough of milk, in any form! Good that it's a good thing at her age! She is happy most of the time (that is, when she is not getting frustrated), and interested in her environment. She is on the cautious side when it comes to physical activities. While she has been walking holding barely one finger for a long time, she hasn't developed the self-confidence to try walking by herself. Even when she is literally 2 inches away from something to hold onto, she isn't taking any risk. She usually reverts back to crawling to go where she wants to go. She is pretty good at communicating, pointing at things and having a couple of words now. Her 2 favorite words are "dada" for her favorite big brother and "gogogo" when she wants to go somewhere or when she wants us to give her whatever we are holding (I haven't figured out the connection with the sounds, though. I doubt she is trying to say "give me" but who knows.) She occasionally says "mama" and has said "lait" (milk) a couple of times when pointing to her bottle. It might still be coincidence. Anyways, she is starting to become a lot of fun.